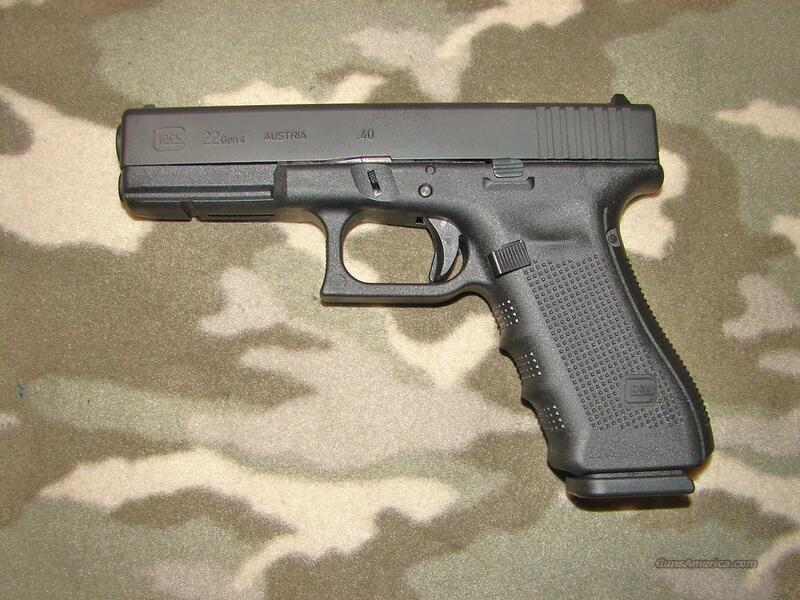 Description: Glock Model 22 Gen 4 Semi-Auto Pistol serial #RHB880, 40 S&W, 4 1/2" barrel that has a bright, excellent bore. The metal surfaces retain about 99% plus original matte blue finish that has very little if any noticeable wear. The black polymer grip frame rates like new as well and features the block style grip checkering and a front accessory mount. Other features include the modular grip strap and reversible slide release for ambidextrous operation. The pistol is equipped with a set of standard factory sights, has a JoJo's Gun Works back cover plate for the slide and a drop-in 3.5 lb Ghost trigger. The original parts are included as well. Pistol is housed in the original factory hard case which contains the manual, lock, two grip frame adapters, the fired casing and a spare 15 round drop-free magazine. A like new example of these quality service pistols that has a couple of small, practical upgrades.